Notes: Astwell Castle is a manor house in Northamptonshire, England about 1.5 miles (2.4 km) south west of Wappenham. It is a listed building and part of the parish of Helmdon, a village 1 mile (1.6 km) west. The De Wauncys were amongst the earliest possessors of this manor since the Conquest. From them, it descended to the Brookes. On 24 April 1471, Thomas Lovett II acquired Astwell in exchange for his hereditary estates by a family arrangement with his mother's cousin, Dowse Billing and her husband William Brooke. The house was begun by Lovett. George Shirley, Esq. (created a baronet, on the first institution of that order, by James I. in 1611), Lovett's grandson, was the next possessor. He partially or totally rebuilt the manor house. From him this manor descended to Washington Shirley, 5th Earl Ferrers by whom it was sold in 1763 to Richard Grenville-Temple, 2nd Earl Temple. He was succeeded by his nephew, George Nugent Temple Grenville, 1st Marquess of Buckingham, and whose son, Richard Temple Nugent Brydges Chandos Grenville, 1st Duke of Buckingham and Chandos was also associated with the manor house. Biddlesden Abbey had possessions in the manor. 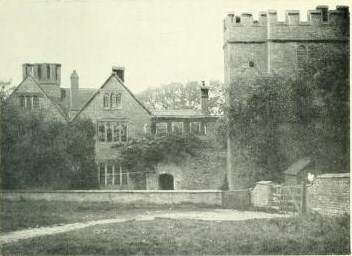 By 1874, the manor house had been largely dismantled, some of the "inferior offices" becoming a farmhouse, and a "broad embattled tower" remaining.